Today’s post is inspired by yesterday’s Atlantic. For the In Focus section, Alan Taylor sent out a request for topics and promised to post high resolution pictures for the first 40 topics he received. Number 18 contained a lovely shout-out to Grandma got STEM from Alan, inspired by Emily Lakdawalla. Emily Lakdawalla (@elakdawalla) asked for something related to “Grandma Got STEM“, celebrating older women working in science and technology. 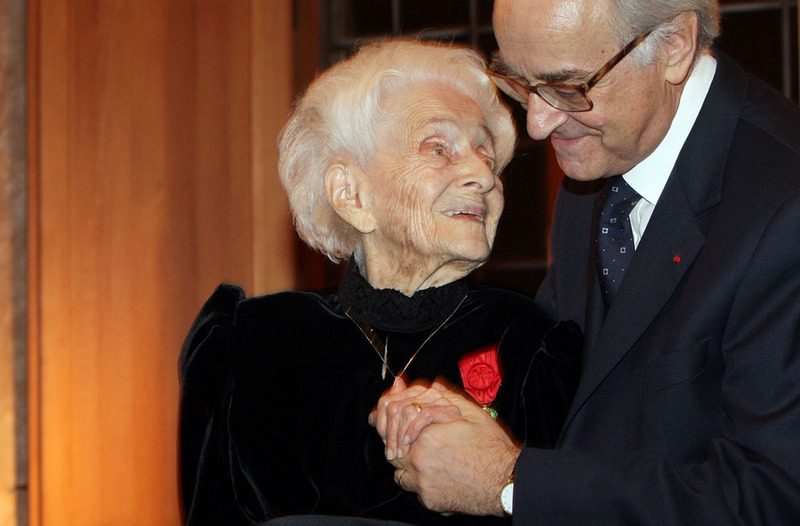 I discoverd this great image of Nobel Prize Winner Rita Levi-Montalcini, as she receives the Legion D’Honneur Medal from the French Ambassador Jean-Marc De La Sabliere at the Villa Medici on December 5, 2008 in Rome, Italy. Levi-Montalcini was well-respected for decades of research and discoveries in neurology, winning the Nobel Prize in 1986 for the discovery of nerve growth factor. She made significant contributions well into her 80s, living to the age of 103, passing away last December. Here’s more info from the Guardian. This entry was posted in Medicine, Neurology. Bookmark the permalink.